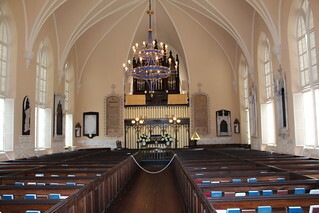 The French Huguenot Church, located at 136 Church Street, was built in 1844 to the design of Edward Brickell (E.B.) White. 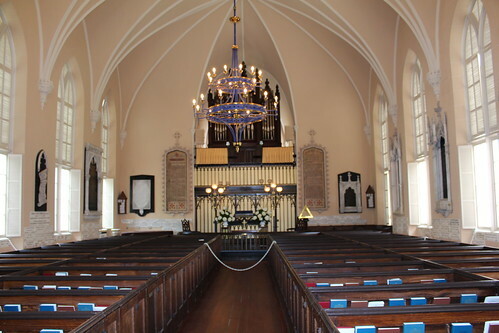 Its congregation traces its origins to the 1680’s refugees from Protestant persecution in France, and remains the only independent Huguenot church in the United States. Charleston’s first Gothic Revival building, it is the third church built on the site. The first Huguenot Church was blown up by city authorities in an attempt to stop a spreading fire and replaced by a simple brick church in 1800. The French Huguenot Church was used in the film Cold Mountain for the scene in which W.P. Inman (Jude Law) ties the corrupt Minister Veasey (Phillip Seymour Hoffman) to the fence.